Eventually I do get around to making those recipes I intended. Like fritters with the tromboncini. Thankfully they keep well in the fridge for two days after grating them. Life gets in the way of planning sometimes. Little things, like a root canal. Three days ago I was going to make fritters but an aging crown with a problem messed up my week. 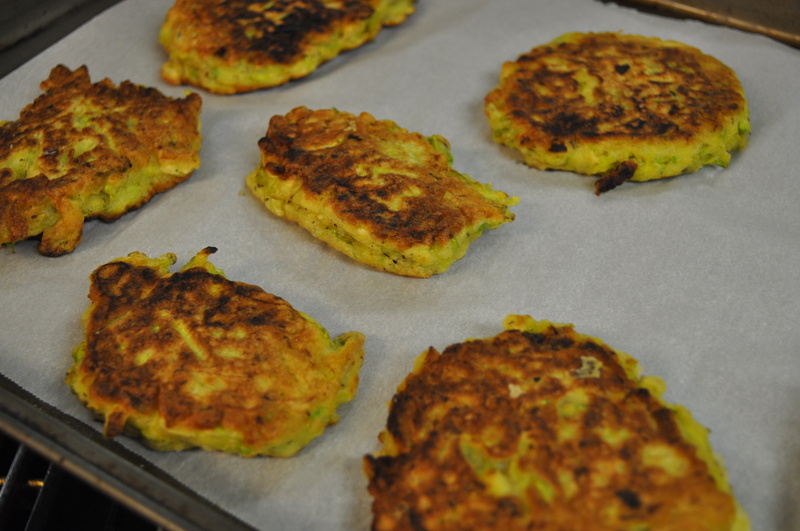 As for the fritters, they all got done today. 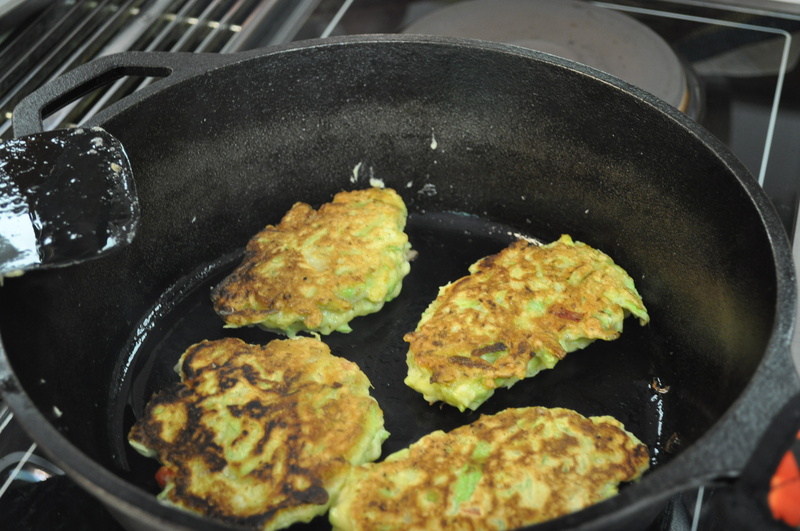 The best way to make these fritters is in cast iron. It retains the heat better and you can use less oil. This time I measured nothing. I did it all by sensing the consistency I wanted. The batter? Made with those two large troboncini, grated. That yielded a couple of pounds of shreds. I added flour until I liked the coverage. One heaping teaspoon of baking powder. Six small eggs. Four scallions. A sweet red pepper, diced. A shallot. Salt. Pepper. Thyme. In other words, I used what I had and what I like. 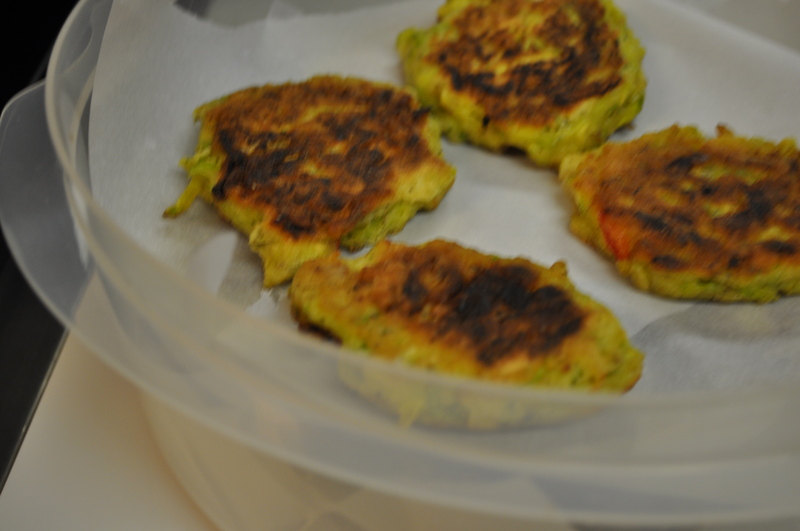 These fritters puff up nicely because of the baking powder. After browning, I put them on parchment paper in a 225 degree oven to finish their centers without burning them. I made different sizes. 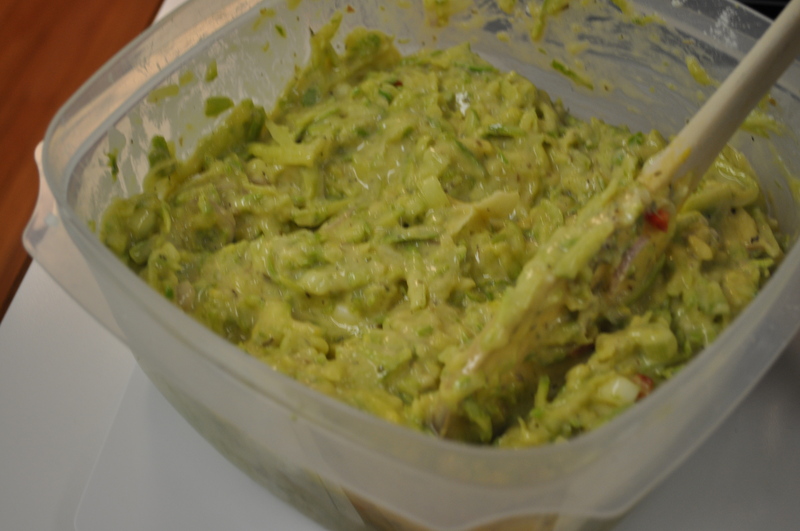 Some to use as appetizers and some to use as a side dish with dinner. Most of them went into a container in layered parchment, to be frozen. All winter long I can enjoy these just by pulling out a layer or two and reheating them. Now, it’s off to the garden tomorrow to see if there are a few more to harvest. All that is left in my garden are herbs, tromboncini, one pepper plant, and a half dozen struggling tomato plants. This summer here with the latest lack of rain had pretty much devastated the water loving plants. This weekend I will do a tally of what succeeded and what failed in this very weird summer. At least those tromboncini did well. Posted in Food, Gardening, Hobbies, Weather and tagged cooking, Food, foodie, gardening, hobbies, weather. Bookmark the permalink.